I thought I'd share a top-ten list of the ingredients that I find essential to have on hand in my Joyously Domestic kitchen these days. If you are a long-time reader of the blog (love your guts!) or a new reader who plans to stick around (that would be fabulous! ), these are ingredients that you are apt to find in many recipes that I share here. There are few dishes - especially savory ones - in which I don't include some type of fresh herb. My favorite would be cilantro. I use it in pretty much any Mexican-themed dish that I create or prepare. Of course, I use fresh basil as often as I can in pasta dishes and Italian-themed recipes. I love thyme in most of my soups and stews. And, I adore rosemary when I roast potatoes or make homemade French fries. If nothing else, I utilize fresh herbs as a finish to many dishes - especially slow-cooked dishes - to bring freshness and brightness to the dish just prior to serving. When my recipes call for butter, I mean real butter. The only recipe that I sometimes make with margarine is my No-Bake Cookies simply because that's the way my mom made them. I, honestly, am trying to break away from using it in the recipe, but I just don't think they turn out as good using actual real buttah. For everything else, only real butter will do. This is a rather new ingredient for me, but I now wonder why I waited so long to start buying it. Perhaps it was the price, but I've come to believe the cost is totally worth it. I use it in so many recipes now and even pop popcorn in it instead of using regular oil. I have made granola with it and had success with it in a cookie recipe recently. Stay tuned for recipes in the future using this amazing ingredient. I've posted several recipes for making steel cut oatmeal in the slow cooker overnight. The Joyously Domestic household loves its steel cut oats! They are hearty, healthful and the best type of oats for making overnight oats. I have used them to make breads and scones, too. Check out my latest steel cut oats post - my Slow Cooker Morning Glory Steel Cut Oatmeal. You'll find a lot of potato dishes here on the blog. When my husband and I were dirt-poor during college years ago, I always said that I could come up with dinner as long as I had potatoes in the house. My kids live for potato soup. We love baked potatoes. My husband's favorite food in the whole world is fried potatoes with sautéed onions. And, I'm known for my mashed potatoes at our family gatherings. To top it all off, it was my Roasted Ranch Potatoes with Bacon and Cheese that pretty much launched Joyously Domestic ... it has become our most-popular recipe with almost a million views. Bottom line - potatoes rock! You'll see cheese as an ingredient in a lot of my recipes. I am a total cheese lover! I'd take a wedge of Parmigiano Regiano to nibble on over chocolate or ice cream any day! I keep several kinds of vinegars on hand. My favorites are balsamic and apple cider. Often, when I can't quite figure out what's missing from something I'm working on recipe-wise, a little vinegar ends up being the solution. 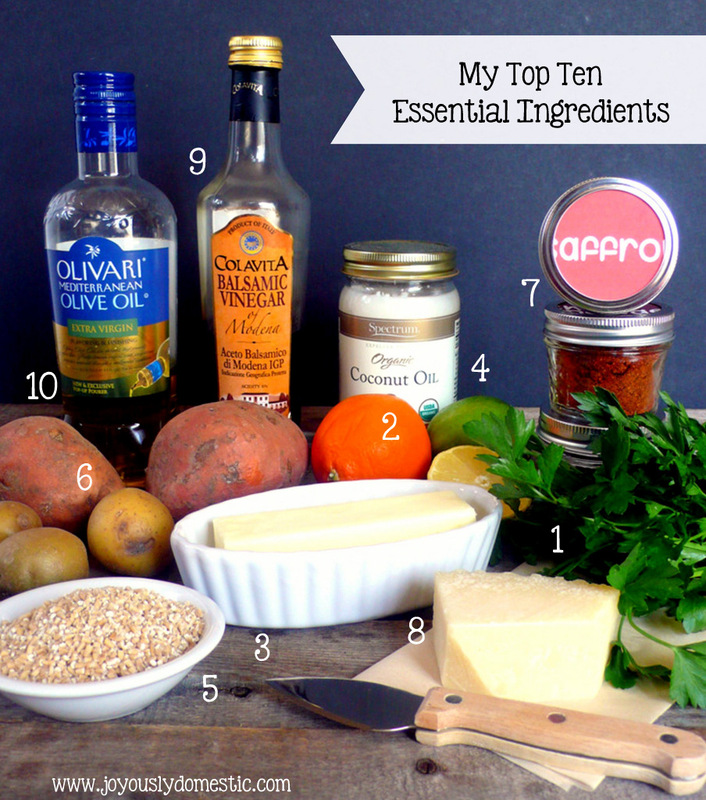 Nine times out of ten, I use olive oil as my oil of choice. I buy some that I use for cooking and some that is used as more of a finishing oil. The latter is something we, also, like to serve with a little cracked black pepper in a dipping dish alongside a fabulous loaf of bread. My fifteen-year old daughter, Allanah, and I are suckers for bread and olive oil. It's, also, my best friend sometimes when I'm taking food pics. If the food starts looking a little dry, a tiny drizzle of olive oil comes to the rescue to bring some sheen back to the food (especially meats). Mmmmmm....yes, I also keep all of these on hand, always, except coconut oil. I haven't gotten into that yet, but I've heard really good things, so I need to pick up a jar.